DIRECTIONS: From Hwy. 395, take Hwy. 158 (June Lake Loop South) to Knoll Ave. (at Villager Motel). Turn right and proceed to 2 blocks to Alderman, turn left and go 2 blocks to Crawford. 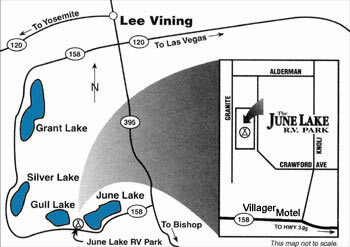 Turn left and proceed 250 feet to June Lake RV Park. Note: If coming from the north, do not take June Lake Loop North turnoff. Proceed south to the June Lake Loop South (Hwy.158) and follow directions above.